Describe what the Beetle-Brow people looked like. In short sentences, name and describe two of the games the boys from both tribes played. Write a short paragraph describing why Grandfather thinks the Beetle-Brow clan looked different from the neighboring tribes. In a short, descriptive paragraph describe how the tribes prepared for the hunt. How did the hunters get the bear out of the cave? Three instruments were used to kill the bear. What were they? What is one of the lessons Jabeth learned about the Beetle-Brows and his friendship with the children of that tribe? Two games are mentioned in this story. Younger children might enjoy playing these games with their friends. The “crack the egg” game is similar to field hockey, with a much smaller goal. Find out about bears—younger and older students will benefit from this article about bears. 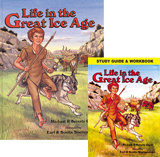 Listen to an interesting audio on the Ötzi, the hi-tech stone-aged iceman! For the more advanced student: Research the methods used in taxidermy today. How similar/different are those methods to the preservation methods discussed in the story?